I tried out a recipe from a bread recipe book I've had for ages. I just wasn't aware that the author was a much respected one among bread recipe writers. Bread making is a seductive activity and it can turn into an all consuming passion if you're not careful. I'm in the throes of it right now... every new recipe looks inviting yet challenging and scary too. The thrill of a successful bread conquers all those fears ultimately. But not always. I know I will try out the recipe from Paul Hollywood's book again soon but before that I had to bake bread for an outing with friends. I'll tell you more about where we're going after the event but today I'm going to tell you about the bread I made for my friends. Once again, I turned to Saee and her blog MyJhola. 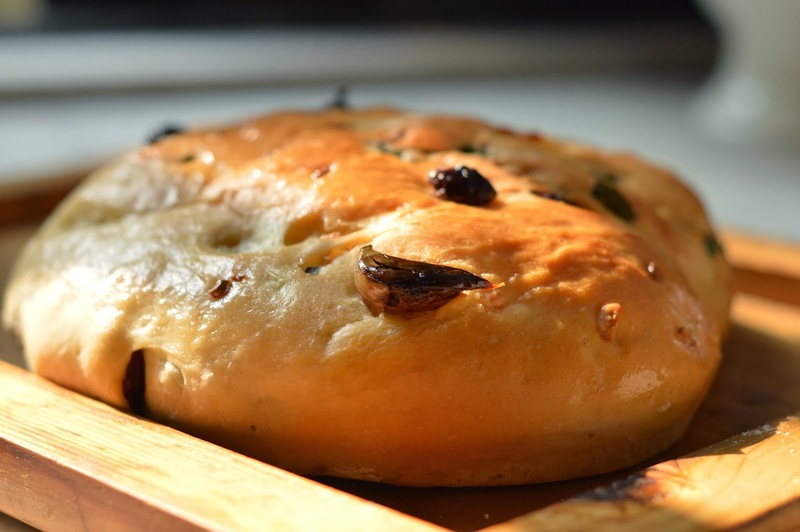 I looked through her list of easy breads and settled on this one - Olive, Basil, Sundried Tomato and Garlic Bread. And it has turned out perfectly as you can see! As always, I have followed her recipe as closely as I could. I didn't use olives as I didn't have any. I also used fresh yeast instead of dried. I have doubled the recipe to make two loaves. In a glass bowl put the yeast and the sugar together and pour the warmed water on top. Give it a gentle stir and leave it to froth. Once the yeast has frothed and you can see bubbles it's ready to be used. Pour the measured flour into a large mixing bowl and pour in the yeast water. 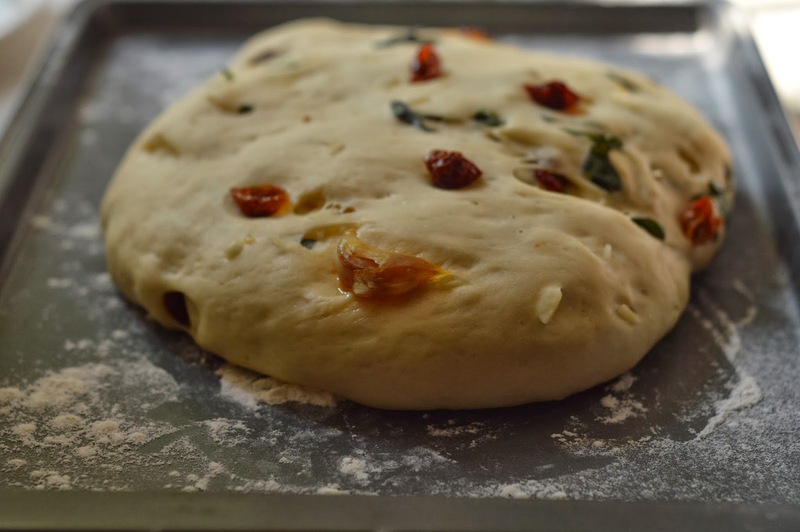 Mix briskly and bring together to form a dough. Turn it out on a lightly floured work surface and start kneading the dough. On one side of the work area take place the salt and pour a tablespoon or so of olive oil. mix quickly and then incorporate into the dough. Add another tablespoon or so of olive oil later as you knead. Pull and stretch the dough and fold it back on itself as you knead it. Ultimately it will be smooth and soft. Shape into a ball and leave covered to rise till double. This should take around 20 minutes. In the mean while you can prep the flavourings - wash and chop the basil leaves, mince the garlic and chop the sundried tomatoes if the pieces are too large. Once the dough has doubled punch it down, add your flavourings and incorporate them into the dough. Divide into two. Shape into free form flattish circular loaves and leave them to rise till doubled again. Bake in a 200C oven for 30 minutes. Brush generously with olive oil as soon as they're out. I baked my loaves on after the other. You can leave the waiting loaf without refrigeration if you're going to bake it immediately like I did. 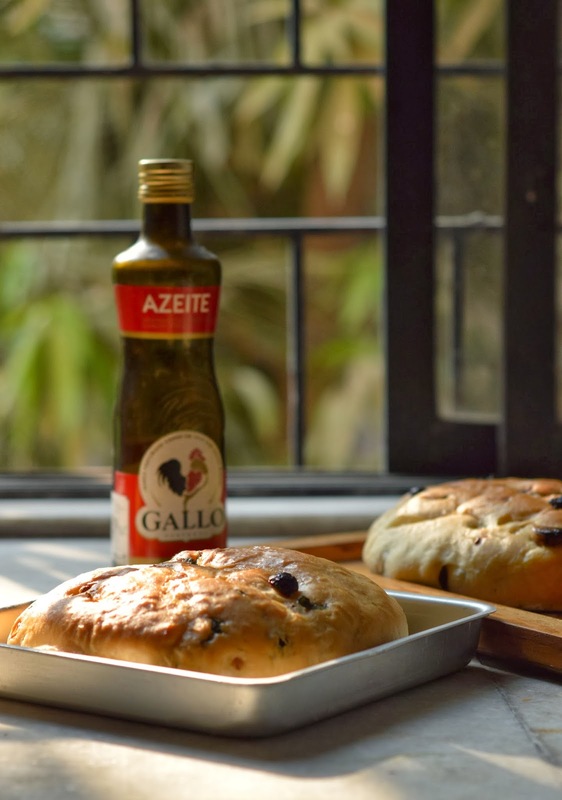 This bread has a soft Bombay Pav like crust and is delicious as it is or warmed slightly and then slathered with butter. Looks so good! Sounds simple and easy to make too! Looks amazing. .a silly question-how can I make small individual buns almost the size of pav? Preferably that would go with soups. I'm a novice in baking.